The Restonic Mattress Company was established in 1938. They were originally called the Triple Cushion Corporation. The first eight manufacturers of the company began building their mattresses using a unique design that they called the "Marvelous Middle". The idea was that the middle of the mattress would be reinforced with extra coils. This would provide better support in the area where the majority of the sleeper's weight rests. In 1946 they changed their name officially to Restonic. Restonic is a mattress licensing cooperative. Various bedding manufacturers produce mattresses with the Restonic brand name and these licensees are shareholders in the corporation as well. By licensing with Restonic these manufacturers are allowed use of their patents and trademarks as well as engineering capabilities and research and design. Another major benefit of this is that they are able to negotiate group purchasing discounts on materials necessary for production. Other mattress brands such as Spring Air also operate in this manner and it is a somewhat common business model among mattress manufacturers. In 1964 Mel Blanc, well known for being the voice of Bugs Bunny and the character's signature saying "What's Up Doc" was also the voice behind the company's radio ads. The "Marvelous Middle" construction technique is finally made a trademark of the company a year later. 1975 brings in more famous people, Steve Allen and his wife Jayne Meadows as a paid celebrity couple promoting Restonic in their advertising for the next few years. 2005 marked a milestone for the company. They were certified by the Underwriters Laboratories for conformity with flammability reguirements. Now their mattresses prominently show the UL Certification tag in order to assure people they're safe to sleep on. Today, fire safety testing has become a universal practice in the bedding industry. In 2008 the Restonic Mattress Company made their mattresses available in retail stores all across the United States for the first time. Their products were previously available only in certain parts of the country. They were able to achieve this by growing a large network of factories and licensees both within the U.S. and abroad as well. They reached their 70th anniversary in 2009. That same year they changed their look and logo and brought in a new tagline: "Supporting Dreams". In 2011 they started a contest related to their "Supporting Dreams" campaign. They wanted to hear about consumer's dreams through submitting a written essay. They offered a $500 award for the most inspiring ideas in order to support that person's dream. The contest went six rounds with six awards and then a grand prize winner was chosen. The grand prize winner was given a factory tour and was allowed to design their own ultimate mattress which they got to keep. All six awards have been given out at this time. The winners ranged from a woman in South Carolina who wanted to get food for her volunteer food pantry to someone in Texas who wanted to raise money for colon cancer research. In July 2011 Furniture First announced that Restonic was one of their preffered mattress brands and would be offered in many stores they supply. Furniture First is a buying cooperative with 176 members and nearly 400 stores in 46 different states. Their dealers will be offering the entire Restonic mattress product line including their innerspring, latex and memory foam models. Obviously this is great news for Restonic - to be growing so quickly, especially in this slow economy. According to the company's website, they believe that people's mental and physical health hinges on getting a good night's sleep. They designed their line of mattresses with this in mind. They believe that by offering a comfortable bed, they have offered the foundation for good rest. Restonic believes that good sleep is sound and uninterrupted. If the body is settled down then the only time they need to move for good blood circulation is once or maybe twice an hour. Good sleep has five stages and a normal person will go through these five stages several times a night. First stage involves light muscle contractions. Often a person will have the falling sensation during this stage. Second stage the body slows down. Your brain waves decrease and overall temperature drops while heart rate and breathing continue steadily. Third and fourth stage is deep sleep. Brain waves go from being in the waking alpha and beta to a much slower theta and delta. In this stage people are unlikely to be awakened easily. Breathing slows way down and the blood pressure decreases. Fifth stage is known as the REM or rapid eye movement stages. This is also called the dream stage. The body's activities pick up, including heart rate, breathing and blood pressure. At least two hours of the night are spent in the REM stage. This is where the dreams occur as the brain tries to bring logic to thoughts and signals. During sleep the cells in the body generate and accumulate proteins. This helps to replenish all of the body's systems. Restonic Mattress Company produces two main lines of mattresses to suit different needs. ComfortCare is their line of innerspring models which feature their "Marvelous Middle" design. Continue onward here for a closer look at the Restonic ComfortCare mattress line. HealthRest is their foam product line which consists of both latex and memory foam beds. 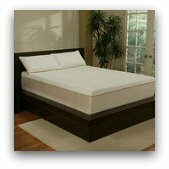 For more information check out our Restonic latex mattress review as well as our Restonic memory foam mattress review. 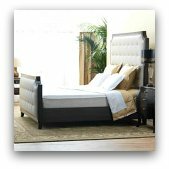 Both collections feature their 70 years of experience in manufacturing mattresses that are helping many to get a good night's rest. Each mattress is backed by a limited warranty from ten to fifteen years, depending on which mattress you buy.